Looking for an for a fun and exciting venue for your child's next birthday? Kids love birthday parties at Gym Zone. We organize the activities, fun and games and keep your child safe. LET'S PARTY - When you celebrate at The Zone the party NEVER ENDS!!! Let us help you plan the perfect birthday bash! At our birthday parties children will get to participate in all kinds of fun activities such as gymnastics, cheerleading, dance, music, rope swinging, obstacle courses, and much much more! 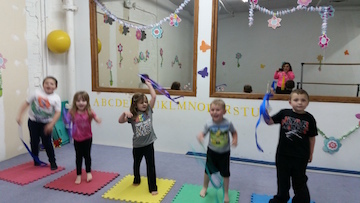 Birthday packages include 1 hour of floor/activity time and 30 minutes in our party room. It is FUN for all ages! Floor time includes a combination of games, trampoline time, relay races, rope swinging, music, and more! We have a party room great for cake and ice cream as well as lots of space to tear into all the presents at the end! Our specially trained staff have the party goers safety as their #1 concern. All our parties are unique, age appropriate, and designed to be FUN, FUN, FUN, for everyone! Parties are generally scheduled on Friday, Saturday and Sundays. Just ask if you need special accommodations! Your kids are going to “flip” for our birthday parties!! !Each Party Package is 90 minutes of fun, fun, fun!!!!!!!! ... reserve your spot today!! You provide presents, refreshments, cake, candles, matches, plates, utensils, cameras and......the kids! parties over 24 kids needs special arrangement. Please call office for details.